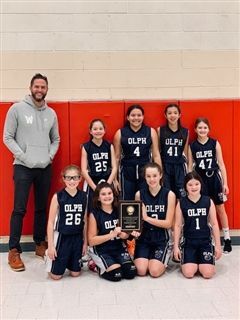 The OLPH sixth grade girl’s blue team and the sixth grade boy’s white team went a combined 6-0 to earn first place honors in their respective divisions at the annual St. Catherine Laboure basketball tournament over the weekend. The girl’s team utilized teamwork, great passing and a stifling man-to-man defense to defeat St. Athanasius, Sacred Heart Winnetka, and St. Norbert in the round robin format. The boy’s team advanced through the winner’s bracket with victories over St. Raymond’s Red, St. Athanasius, and St. Raymond’s White. In their semifinal game, the Warriors battled back from a 14-point half-time deficit to seal the game in the final minute and escape with a narrow 2-point win.